Remember Kelly Wynne, my friend who designs handbags? She’s getting close to launching her new fall collection, but I still can’t get over how much I love her current one! I love the silhouette of the clutch I got – it’s the perfect size and looks great dressed up or down. I’ve worn it to weddings as a clutch and during the day with the strap – very multi-functional. Most of her styles are sold out, however there are still a few Cloud Nine clutches available for purchase here. Get to it, ladies… They’re going to go fast! Click here to shop all Kelly Wynne bags. PS – these espadrilles are now on sale! Today’s the last day to get an extra 25% off the Shopbop sale! I snagged this yesterday. What are you buying? Just enter code SALE25 at checkout! Love this mix – it’s unexpected but totally works together…that bag is beyond! 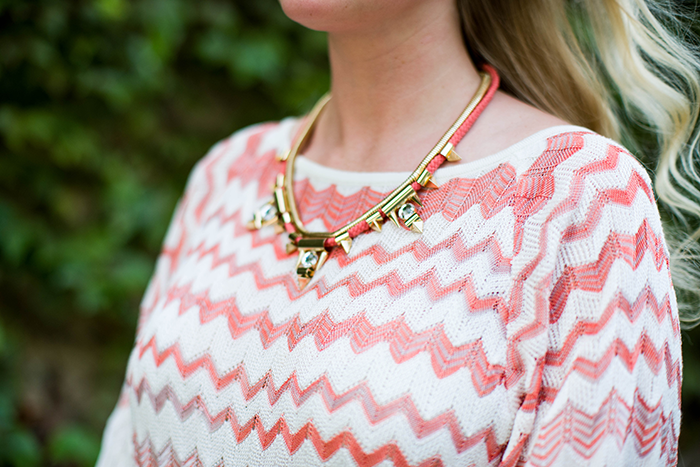 Love this print mix, your necklace is such a nice touch. Nice shorts! And Kelly’s bags are nice. I had the opportunity to go to one of her showcases here in Houston at TTR, she’s a sweet girl. loooooooooove those shorts!! you look gorg. Love the pattern mix! That looks like the perfect summer sweater. Definitely checking out Kelly’s line! 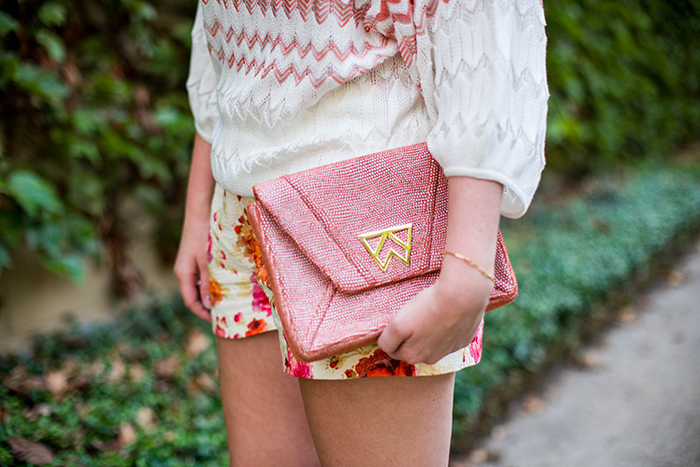 Love the Missoni top and that clutch is amazing!! Fabulous combination of prints and patterns,in love with the top! I love these patterns together! And that is such a great structured bag… so cute! Digging so much about this outfit. Pattern shorts are my jam right now :) http://winkthinks.com/2013/07/summer-shorts/ and I love the choice of neutral shoes! Pretty outfit! Love the top and shorts.